A new impact crater has been found under more than a mile of ice in northwest Greenland. Credit: NASA Goddard. Scientists didn’t think they would be able to find evidence of ancient impact craters in places such as Greenland or Antarctica, which should have been cleared away by erosion by underlying ice. But, in November, researchers found a huge 30-kilometer-wide crater (19 miles) beneath Greenland’s Hiawatha Glacier. 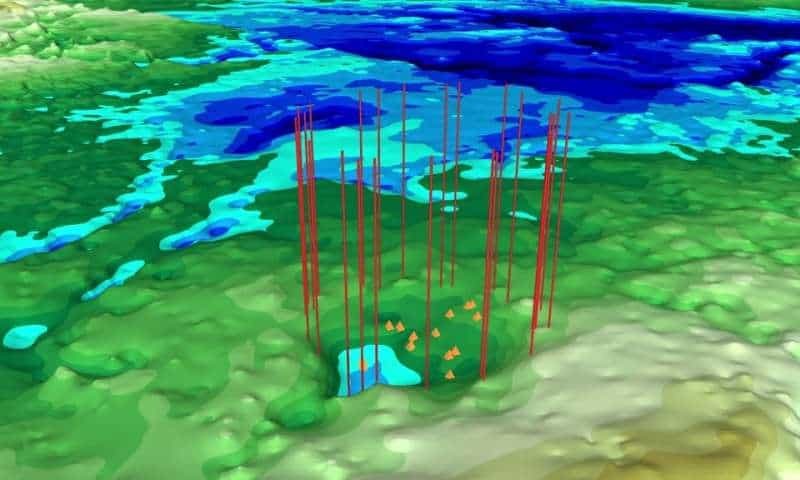 It was the first meteorite impact found beneath an ice sheet, a breakthrough moment in geoscience that combined the latest imaging technologies. Now, researchers report finding an even larger crater beneath Greenland’s thick ice. With a width of 36.5 km (22 miles), if confirmed, the new crater would be the 22nd largest impact crater found on Earth. The new site was identified just 183 km (114 miles) from Hiawatha, but, judging from current evidence, the two impacts weren’t likely made during the same time. Both are fairly recent though. Scientists estimate that Hiawatha is no more than three million years old, while the new impact site in northwest Greenland was likely formed by an asteroid impact within the past 2.6 million years. Although it doesn’t have a formal name yet, researchers are considering naming it the Paterson crater, in honor of the late glaciologist Stan Paterson, who helped reconstruct climate data for the past 100,000 years using ice cores from Greenland. “We’ve surveyed the Earth in many different ways, from land, air, and space—it’s exciting that discoveries like these are still possible,” said Joe MacGregor, a glaciologist with NASA’s Goddard Space Flight Center in Greenbelt, Maryland, who made contributions to the discovery of both craters. MacGregor was inspired by last year’s discovery to scour topographic maps for more signs of other craters. He eventually noticed a circular pattern in an ice surface map made using data from NASA’s Terra and Aqua satellites. His suspicions were confirmed by raw radar data, including those collected by NASA’s Operation IceBridge, which were used to study the topography of the bedrock beneath the ice. The images that MacGregor and colleagues assembled show all the hallmarks of an impact crater, including a flat, bowl-shaped depression in the bedrock, surrounded by an elevated rim and centrally located peaks. Measurements also revealed a negative gravity anomaly over the area, which is also characteristic of impact craters. Given the proximity of the two craters, it’s plausible that a double asteroid system impacted the area. In order to investigate this possibility, the researchers studied the erosion rates of the two craters. The findings suggest that the new crater is far more eroded than the Hiawatha crater, and consequently older. Previously, two pairs of geographically close craters in Ukraine and Canada were also found to be unrelated.